For this kind of cash we really can only applaud Squier for the Bullet Mustang HH. You'll want to upgrade the pickups down the line, but at this price, it's hard to complain. The original Fender Mustang is something of a cult classic. It was loved by alternative bands and players - including Kurt Cobain - in the 90s for its short scale, affordability and potential for modding. This is 2017, though: things have changed. Is there still appetite for a Mustang, Sally? Squier certainly thinks so, judging by this new budget, HH-configured Bullet Mustang. Available in Black or Imperial Blue with a natty metallic finish, this is certainly an attractive little guitar. 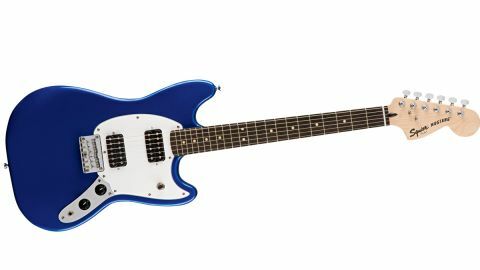 In keeping with Squier’s other entry-level models, the Bullet Mustang has a basswood body which gives it an incredibly lithe, lightweight feel. If you’re used to the manly heft of a Les Paul then this, combined with its 24-inch scale length, can give the Mustang an almost toy-like feel when you first pick it up. The two humbuckers are the most obvious departure from the original, providing angular grit in the bridge position and a pleasing, earthy warmth in the neck. Realistically, you’re not going to be extracting much in the way of classic vintage tones on account of the basswood body, but the Mustang’s pickups hold their own across a range of genres. The bolt-on maple neck and six saddle hardtail bridge feel reassuringly rigid, while the tuners did a sterling job in our tests of holding their pitch without too much hassle. The volume and tone knobs, often a clear indicator of quality control in budget guitars, are installed firmly enough with no evident wobble, while the pickup selector switch is angled so it won’t get knocked if your playing becomes too... ahem... enthusiastic. Meanwhile, the 12-inch radius, rosewood ’board is pancake flat and makes string bends simple for even the most sausage-fingered player. The C profile neck is also extremely comfortable to hold, while the satin finish makes fretboard-spanning licks a doddle. One exciting possibility this guitar offers is its potential as a base for modding. It’s easy to see how those of us with DIY leanings could change out the pickups to something more upmarket, swap the tuners or even just practise our setup and maintenance skills without the risk of ruining a more expensive instrument. Honestly? It’s hard to be overly critical. By today’s standards, £120 is practically peanuts to spend on a new guitar. For Squier to cram in the features it is, with the overall levels of build quality on display, is seriously impressive.